In January the newest member of the Prius family, the Prius c from Toyota, made a big splash for its world debut at the North American International Auto Show in Detroit. At the time of that announcement I was just wrapping up a test drive and review of the previous new kid on the block, the Prius v. So at that point I was prejudiced. 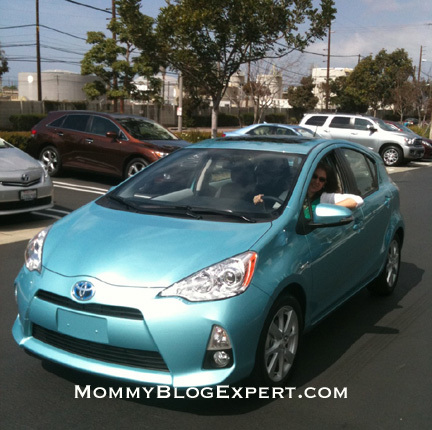 You see, I'd had such a fabulous long distance test driving experience with the Prius v to the Consumer Electronics Show several months ago that I couldn't imagine that the Prius c would even compare. That jaded opinion changed when I had the privilege as an inaugural member of Toyota Women Influencers Network (TWIN) to be one of the first to take the Prius c for an in-city test drive around Torrance, California, the U.S. corporate headquarters of Toyota. This was a little less than two weeks before the car was even available to consumers at dealers. So it was thrilling to have this kind of insider's opportunity to try various 2012 vehicle models out during the TWIN Camp Toyota hosted for us with the company's product managers and marketing team on hand to personally show us around and answer questions from our social media group of women bloggers. I think what surprised me most about the Prius c was the overall feel of interior space as well as the way the vehicle handled. Power was excellent upon acceleration, too. I really couldn't feel the difference as I drove, speeding up and slowing down, as the car switched automatically between electric and fuel modes. Experienced from the driver's seat -- though slightly smaller than the Prius v I'd previously tested -- this was certainly comfortable and adequate. That really says a lot when you consider that I am rather tall and still found that the headroom generous, whether getting in and out of the car as well or when driving. 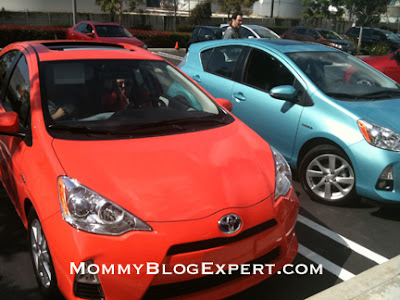 The Prius c is available in four different models with a variety of amenities among them the sophisticated Entune technology in two of the models. Color choices, depending on the model, include an edgy palette of youthful and fun hues ranging from Absolutely Red, Magnetic Gray Metallic, and Habanero to Classic Silver Metallic, Moonglow, Blue Streak Metallic, and Summer Rain Metallic to elegant classics like Super White and Black Sand Pearl. In summary, with all that plus a starting price of $18,950 and average mileage the best of any non plug-in hybrid car at 53/46 mpg, there is a whole lot to like about the smallest car in the Prius family. See Toyota.com for more information about the aesthetic and functional features of the Prius c as well as all the technical specifications of this vehicle and dealers where you can test drive it for yourself. 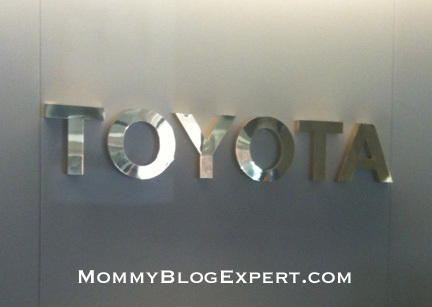 Watch for another Mommy Blog Expert post shortly explaining what TWIN is and how I got to become associated with Toyota. That post will also give you an idea of the kinds of things our team of women brand influencers learned about and experienced during our camp experience. 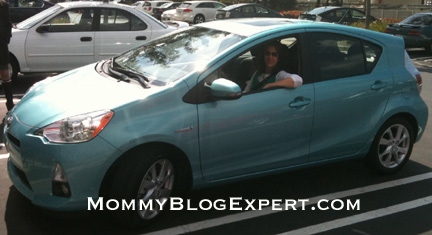 Would love to hear from others who have had a chance to drive the Prius c. Also, you're invited to leave a comment if you have stories about any of the other members of the Prius family that you have driven. I look forward to hearing all about it. FTC Disclosure: I am a member of the Toyota Women Influencers Network TWIN community through a program with Clever Girls Collective. As a member of TWIN I was hosted by Toyota for TWIN Camp as well as have had the use of various vehicles during the program. I did not receive any compensation for writing this post or payment in exchange for participating. The opinions expressed herein are mine, and do not reflect the views of Toyota or any of its brands. See complete FTC Disclosure information that appears at the bottom of MommyBlogExpert's main page and at the bottom of every individual post on this blog, including this one.